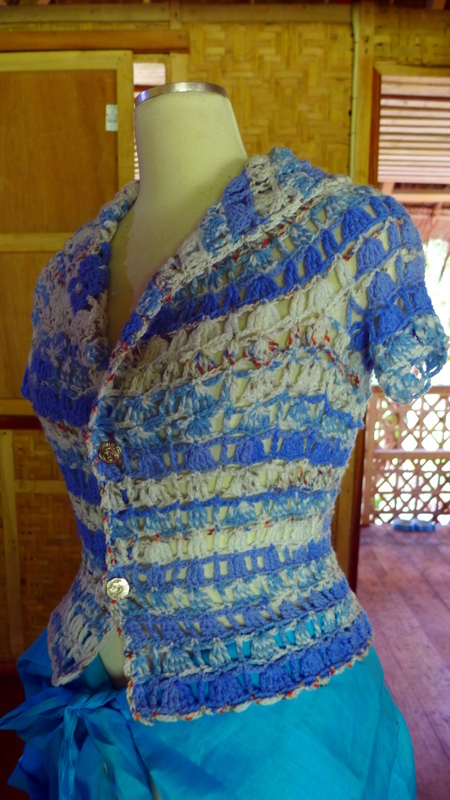 I made this cardigan – top-down, circular yoke, seamless – with a shaped waist and flattering peplum for my body shape. I have a very small bust and a large midsection, thus, a garment that shaped at the waist and flared at the bottom was what I needed. Here is a documentation of the process of making this cardigan. 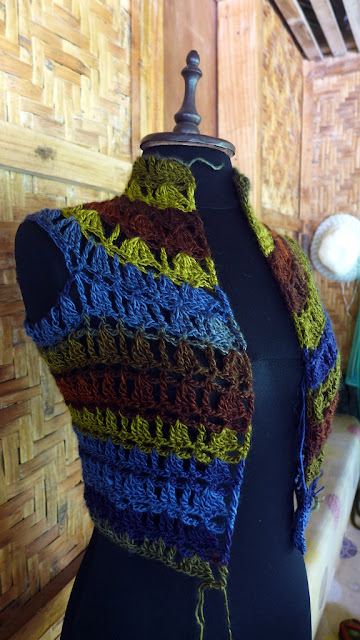 Understanding the shaping involved in altering a simple treble shell stitch pattern will hopefully help you to make a cardigan in your shape, style and size. Yarn: Rainbow by Ice Yarns 100% acrylic (100 grams/230 meters). Substitute with Yarn Weight 4: Medium (9 wpi) or Worsted weight yarn. Hook: 4.5mm Buttons: 5 pieces half inch buttons. Yarn needle for weaving in ends. 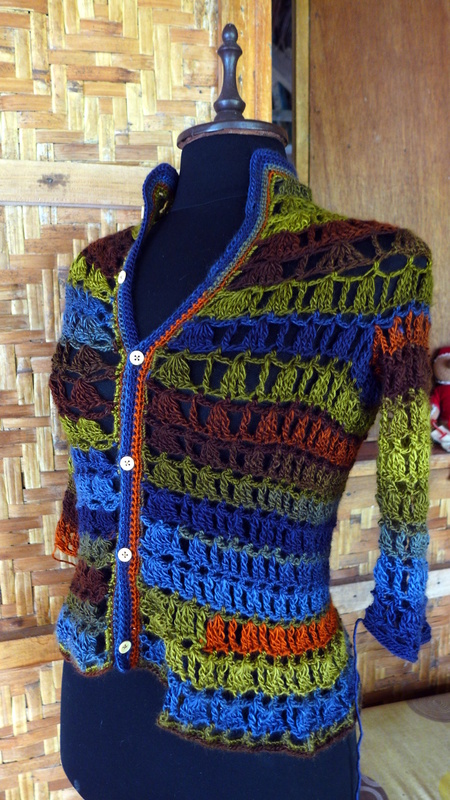 The cardigan is crocheted in rows from the top down, open at the front. 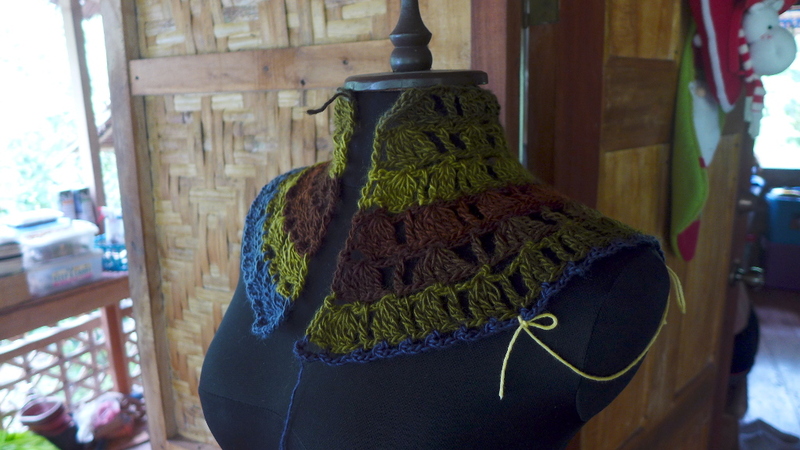 Shaping is done in 6 sections: collar, yoke, bust, underbust, waist and peplum. A seventh section of the design is the sleeves. 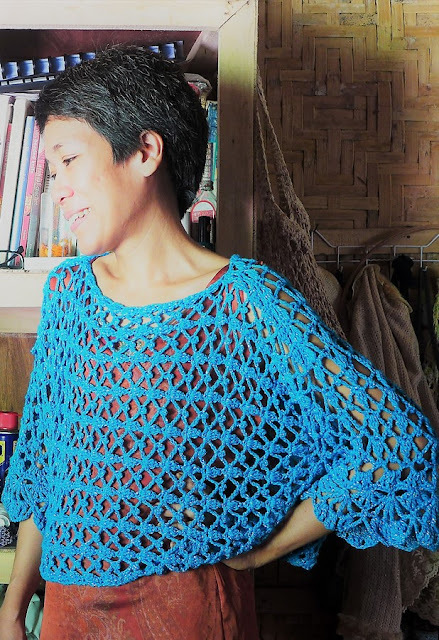 The sleeves are crocheted in the round around armholes that are created by making a length of chain that goes under the armpits. The division into sections allows you to alter the style of the cardigan. 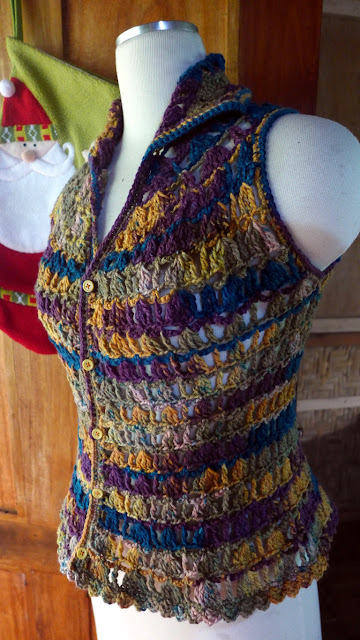 The stitch pattern used throughout this garment is a variation of a free skirt pattern by Garntudio.com, makers of Drops Yarns. * The stitch pattern is worked on a foundation of multiples of 6 stitches. The stitch pattern consists of alternating rows of (1) tr-groups; and (2) hdc-ch sts (observe the stitch diagram below). I modified this pattern so that it can be used to make a shaped garment. The modification involved increasing and decreasing in various increments. Increase and decrease are made at the tr-group rows while the hdc-ch rows are adjusted accordingly. The instructions below show how the basic pattern is modified in order to create the desired shaping. Make a foundation chain in multiples of 6. Measure around your neck to determine the length of the chain. In my case, I started with a foundation of 42 chain stitches (about 13 inches long). Now, ch 6 (count as 1 ch sp, 1 tr, 1 ch), turn. Row 1: 5 tr in 9th ch fr hook, *ch 1, sk 2 ch, tr in next ch, ch 1, sk 2 ch, 3 tr in next ch, rep fr * across leaving last 6 ch unworked, then complete the row as follows: ch 1, sk 2, ch, 5 tr in next ch, ch 1, sk 2 ch, tr in last ch; ch 1, turn. Row 2: Hdc in first tr, ch 4, sk 2 tr, hdc in next tr, ch 4, sk 2 tr, hdc in next tr, *ch 3, sk 1 tr, hdc in next tr; rep fr * across leaving last 6 tr unworked, then complete the row as follows: ch 4, sk 2 tr, hdc in next tr, ch 4, hdc in last tr; ch 5 (count as tr, ch 1), turn. Row 3: Sk first hdc, 5 tr in next hdc, *ch 1, tr in next hdc, rep fr * across leaving last 2 hdc unworked, then complete the row as follows: ch 1, 5 tr in second to the last hdc, ch 1, tr in last hdc; ch 1, turn. Row 4: Repeat Row 2, ending with ch 5 (count as tr, ch 1), turn. This completes the collar (about 2.5 inches tall). If you would like to have a longer collar, rep Rows 2-3, ending the last rep with Row 2. Row 5: Sk first hdc, 5 tr in next hdc, ch 1, *tr in 4-ch sp, ch 1, 3 tr in next hdc, ch 1, rep fr * across leaving last 2 hdc unworked, then complete the row as follows: tr in 4-ch sp, ch 1, 5 tr in next hdc, ch 1, tr in last hdc; ch 1, turn. Row 6: Rep Row 2, ending with ch 5, turn. Count the total number of tr-groups in the last tr row made (in my case this is Row 5). I have 15 tr-groups. Next, divide this by 3. The quotient is 5 – this means, each section of the yoke consists of 5 tr-groups. I will increase the stitches in the Left Shoulder and Right Shoulder sections but not in the Back section. What if you have a number of tr-groups that is not divisible by 3, for example 20 tr-groups? You simply round off the quotient to the higher number. So, if you divide 20 by 3 you get 6.6 which you round off to 7. The Left Shoulder and Right Shoulder sections each will consist of 7 tr-groups and the Back section will consist of 6 tr-groups, for a total of 20 tr-groups. Row 7: Working in the pattern established, make 5-tr groups in Left Shoulder and Right Shoulder sections of the yoke, and 3-tr groups in the Back section. Ch 1, turn. Row 8: Working in the pattern established, make 4-ch loops over 5-tr groups and 3-ch loops over 3-tr groups, separated by hdc stitches; end with hdc, ch 5, turn. Row 9: Working in the pattern established, make 5-tr groups over the 5-tr groups in Left Shoulder and Right Shoulder sections of the yoke, and 3-tr groups in the Back section. Ch 1, turn. Row 10: Rep Row 8, end with hdc, ch 5, turn. Row 11: (In this Row, you will make increases in the Left Shoulder and Right Shoulder sections of the yoke but none at the Back) Sk first hdc, 5 tr in next hdc, *ch 1, hdc in next 4-ch sp, ch 1, 3 tr in next hdc, rep fr * over the 5-tr groups of the Left Shoulder section of the yoke; when you reach the Back section of the yoke, start with ch 1, tr in first 3-ch sp, **ch 1, 3 tr in next hdc, ch 1, tr in next hdc, rep fr ** across the Back section; when you reach the next Shoulder section, work as in the first Shoulder section, reverse shaping, end with ch 1, turn. At this point, you should have a collar with a yoke. 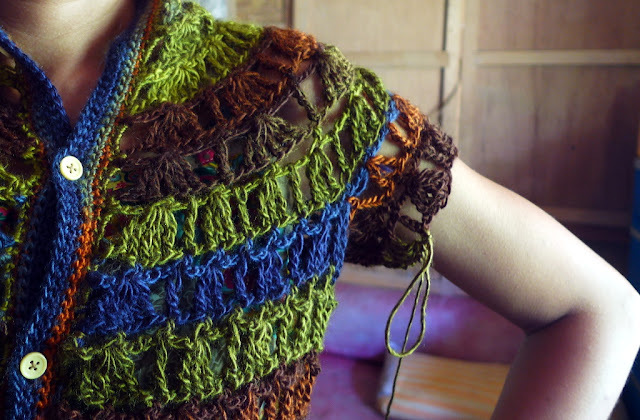 You need to decide if you need to add more rows to the yoke to fit your size – try it on to see if it is just about at the right depth to the underarm. In my case, the piece measures about 7.5 inches from the collar to the end of the yoke. This is sufficient for me, an extra small size, for a garment with zero ease or close-fitting. Here is the piece so far fitted on a 34” bust dummy (I am a size 32). 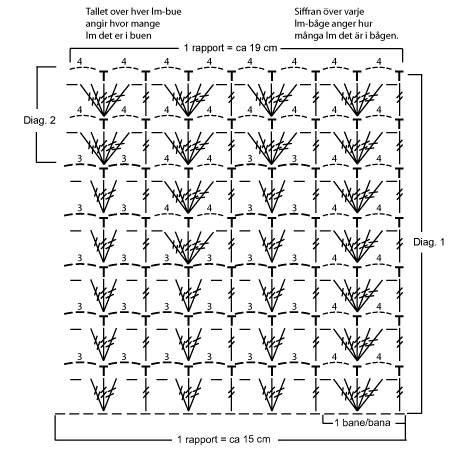 Row 13: As established in the pattern, work 5-tr groups in hdc over 5-tr groups, and work 3-tr groups in hdc over 3-tr groups; end with ch 1, turn. Row 14: Rep Row 8. Row 16: Rep Row 8. Rep fr Rows 13-16 until the desired depth is reached, ending with rep of Row 8. 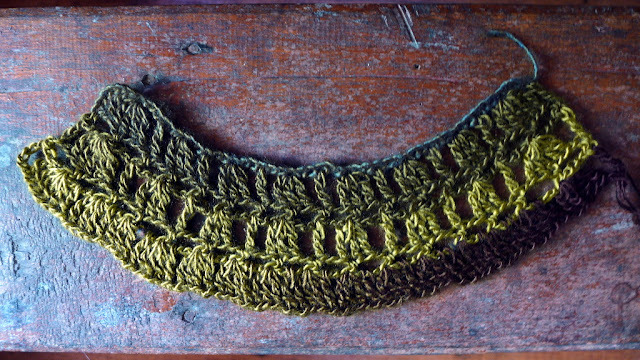 You don’t need to fasten off at this point; you just need to make the chain for the underarm, using the other end of the skein of yarn. The chain that goes at the underarm allows you to make the foundation for crocheting the body of the cardigan. This chain also establishes the opening of the armholes for adding the sleeves later. Put on the piece and adjust the fit. Put a stitch marker where the yoke ends nearest to your underarm on the left front side of the piece. The marker needs to be on a stitch that is at the end of the stitch multiple/pattern rep. In my case, this is after the fourth tr-group from the front of the piece. Next, you need to know the same place at the back of the piece. You might need to get someone to help you with this. Or you can make an estimate, which is what I did, then tied a string that goes from the stitch marker at the front to the stitch marker at the back, going right under the underarm. Put on the piece and see if it fits. In my case, I placed the stitch marker at the back just after the fourth tr-group from the stitch marker on the front. The string is about 7.5 inches long to make an armhole that is about 6.5 inches in length. 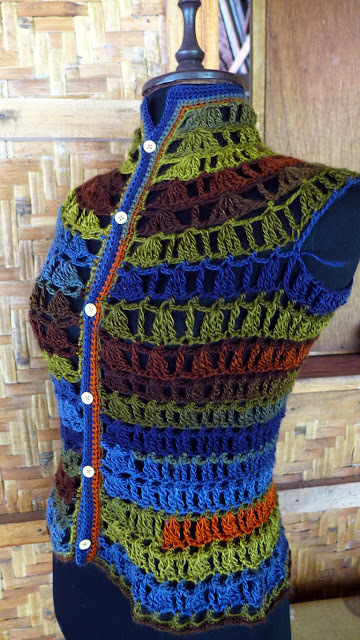 This is a well-fitting zero ease cardigan for myself. You decide how your cardigan fits – adjust accordingly to make the armhole bigger. Just bear in mind that your stitch markers should be placed at the interval of stitch multiples/pattern reps.
Count the same places on the other side of the yoke. Place the stitch markers in the appropriate location. Tie a string at the stitch markers joining front to back. Now you have two armholes made. Put on the piece and see how it fits and adjust as needed. Finally, replace the string with a chain going from front to back. Join to the piece with a sl st and make the appropriate length of chain. The chain needs to be in multiples of 6. In my case, the chains at the underarms is 24 ch. 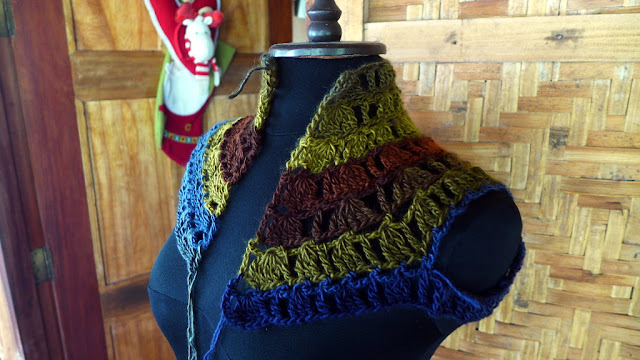 With the underarm chains creating the division between the body and sleeves of the cardigan, you can now proceed to crocheting the body of the cardigan. 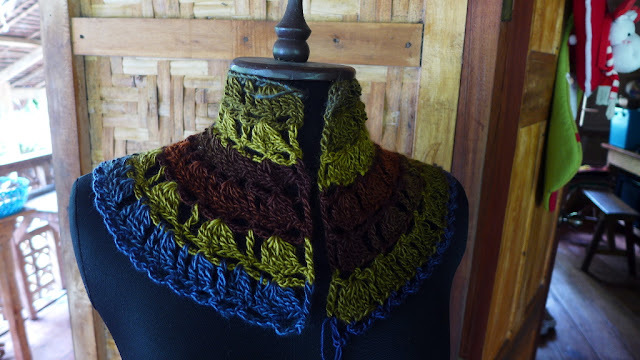 Pick up where you left off (ch 5, turn), and continue working as established in the pattern across the body of the cardigan, working the tr-group of stitches along the chains at the underarm as you have done so at the beginning of the pattern. Work the needed number of rows until you reach the top of the bust (in my case I worked 2 rows of tr-groups to make a depth of 2.5 inches from the underarm). End with a row of hdc and chains (as in Row 8). 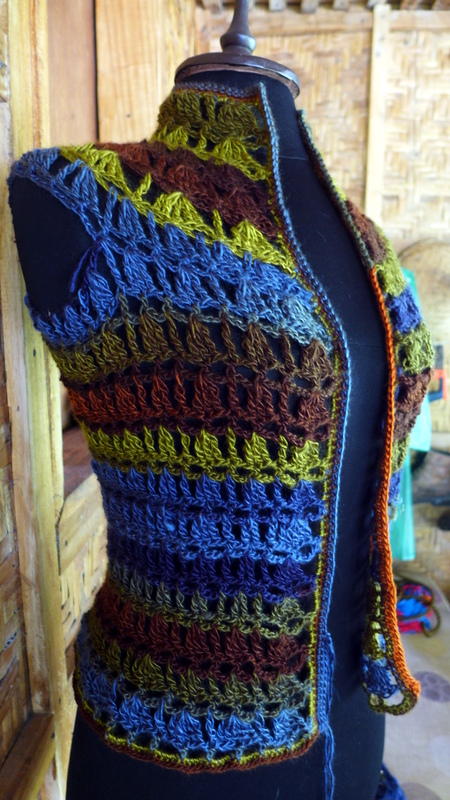 You will now need to shape (decrease) the underbust of the cardigan. (You can skip this part of you want a loose fitting cardigan, in which case you can continue working in the established pattern to the desired length, or flare out (increase) towards the bottom of the garment). In the next rows you will decrease gradually from the underbust towards the waist. Decreasing the stitch pattern here means decreasing one stitch at every third 3-tr group at the first decrease row. In the next two rows, decrease are made by switching to a smaller hook (in my case, from 4.5mm to 4mm hook). The last decrease row is made by decreasing one in each tr group after one 2-tr group. Bear in mind that all tr-group rows begin and end with 5-tr groups. The corresponding hdc-ch rows alternating with the decrease tr-group rows are as established in the pattern but decreasing 1 ch over the dec tr-group. For example, over the 2-tr-group make hdc, 2 ch, hdc, 2 ch, etc, over the 3-tr-group make hdc, 3 ch, hdc, 3 ch, and over the 5-tr-group make hdc, 4 ch, hdc, 4 ch, etc. Note that a hdc is placed in a 2-tr group between the 2 tr stitches. Continue decreasing in this manner until you reach the waist area. From this point, you will increase to make the peplum. 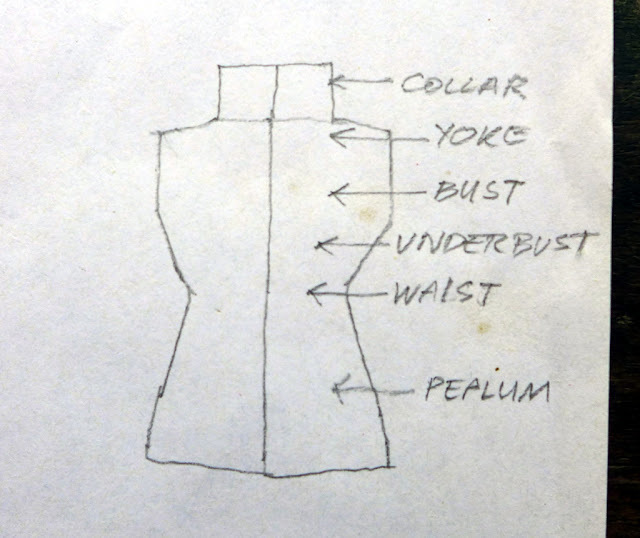 Shaping the peplum gradually is simply a reversal in rows done for the underbust and waist. This will flare out the cardigan towards the bottom. If you prefer a more drastic increase below the waist, you can start by using a larger hook and add more increase stitches to each tr group. Once you have reached the optimum increase over the hips, you may continue working without any shaping, until the desired length is reached. End with a hdc-ch row, then make ch 1, turn, so you will start working on the Right Side the Edging of the cardigan. The edging along the bottom of the cardigan consist of 2 rounds of sc stitches and the neckline and front consist of a total of 5 rows of dc, ch 2-ch sp made for the button holes (I used half inch buttons). I used the larger hook (4.5mm) for the first round, then switched to the smaller hook (4mm) for the rest of the rounds/rows. I worked all around for 2 rounds, completing the bottom edging then worked in rows to complete the buttonholes and front edging. To turn at the corners (at the bottom front and top at the collar), I made 3 sc in each corner sc. The 2-ch sp is made evenly along the front at the fourth round, and at the fifth round, 3 ch is worked in each sp. Fasten off and sew on the buttons. 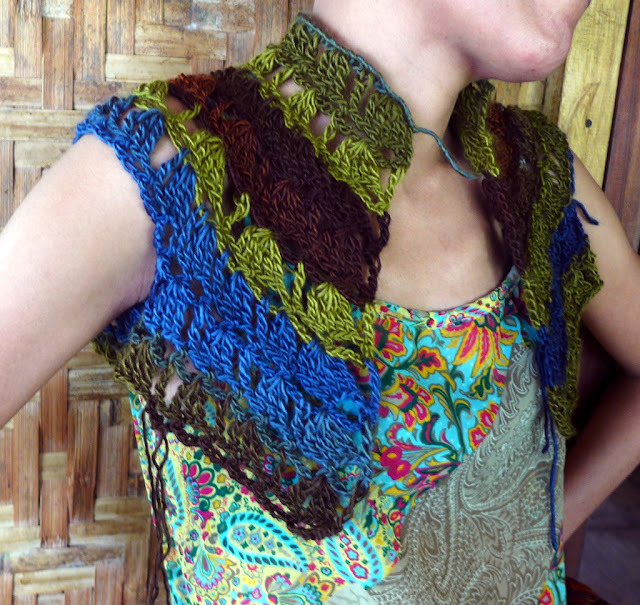 The sleeves are worked around the armholes in the same stitch pattern of tr-groups and hdc-ch alternating rows. You will notice that your foundation for the sleeve is a round consisting of half tr-group and half hdc-ch. You will need to make a half round of hdc-ch over the tr-group to create an even foundation of hdc-ch rounds. Join the yarn with sl st to the last hdc at the armhole, then make the appropriate number of ch to go over the tr-group, as established in the pattern. Make this hdc, ch over the remaining tr-group and join with sl st to the first hdc. From here, you crochet in the established pattern even rounds for the sleeve to the desired length. End with a hdc-ch round, followed by 2 rounds of sc stitches worked evenly all around the cuff of the sleeve. Fasten off. Work the other sleeve in the same way. Weave in all ends and block the cardigan. I am very happy with the outcome of this Crochetology challenge. I managed to come up with a fairly flexible design. During the process of making this cardigan, I noticed that it can also be made sleeveless or by adding a row around the armholes, to make cap sleeves. 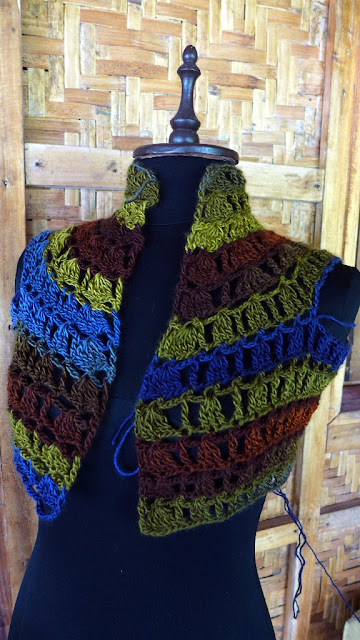 By using a different stitch pattern at the collar (a stiffer stitch pattern), the cardigan can be worn with a standing collar. The cardigan can also be made longer. 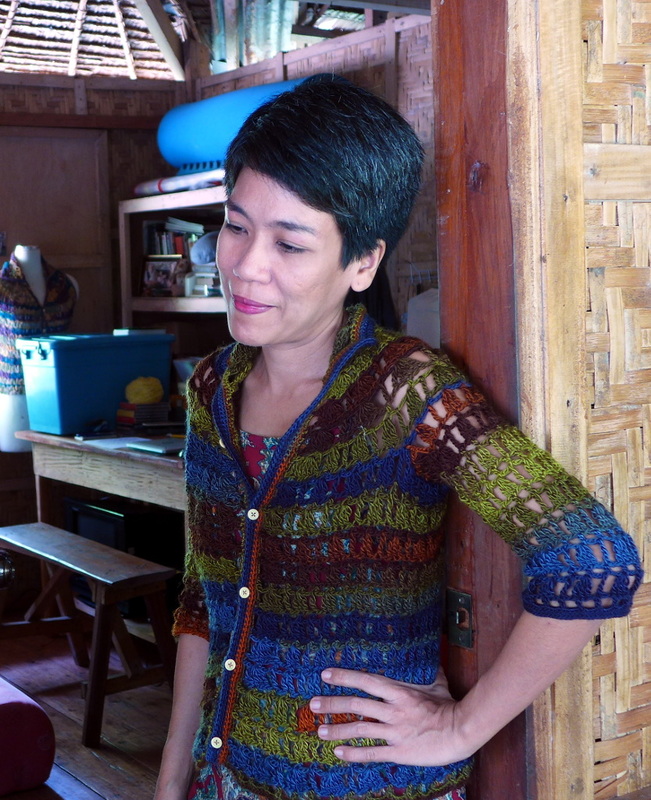 The advantage of crocheting your own clothes is that you can make them to fit your exact size and shape. Now, if I were to make another version of this design, I would make it one row longer and make the bottom edging tighter along the row. The sc edging along the front, however, seems too tight. It is probably better if I worked 4 sc along the tr-group rows and 2 sc along the hdc-ch rows. I will also use a better quality yarn next time. 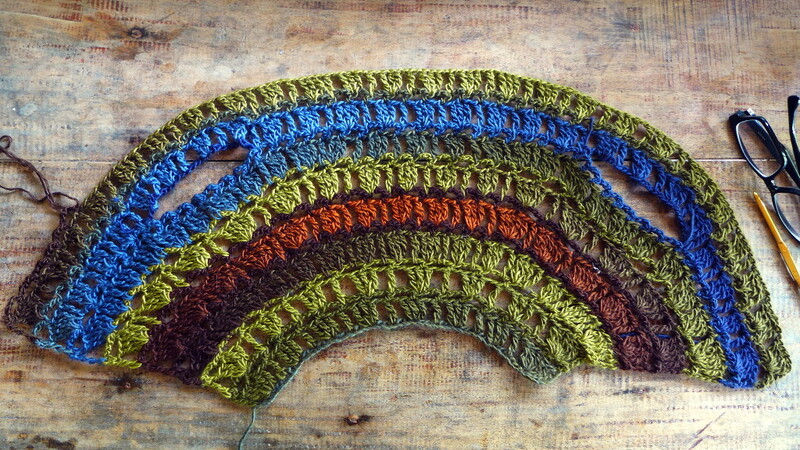 Rainbow by Ice Yarns has a tendency to pill. 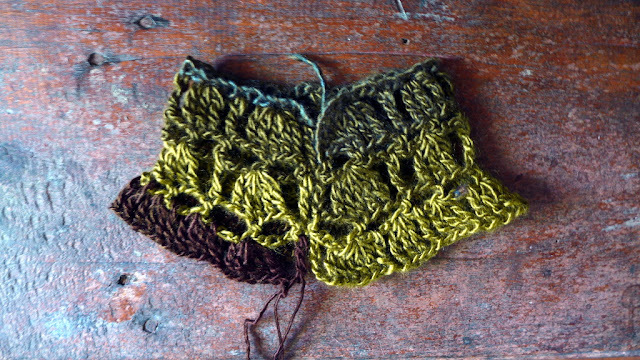 Above are two other design variations, both using the same basic stitch pattern of tr-groups and hdc-ch rows. The first one has shorter sleeves and a wider collar. The second one is sleeveless and shaped to be narrower at the shoulders. This second design entailed more complex shaping and dividing, the Left Shoulder and Right Shoulder sections being worked separately from the back in order to achieve the narrower shaping. I hope that these notes give you some idea of how I improvise stitch patterns to make new designs.